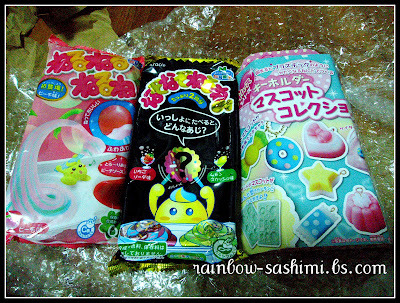 My parcel from Love Melancholy has arrived Ｏ(≧∇≦)Ｏ It's a parcel of Japanese sweets and toy goodness! I went ahead I got myself a Peach Neru, a Mystery Nazo (which has been discontinued and out of stock) and a Kutsuwa Kit! On the box of the clay kit, it says desert! But I think sweets or candy is more suitable! The actual sweets kit has tarts and waffles! Looks more like deserts suits it more, compared to a kit with candy and kompeito! LoveMelancholy sells all the Kracie Popin' Cookin' and Happy Kitchen. They also stock Neruneru, Gumi Tsureta, also by Kracie and Meiji Takoyaki candy! The newest, upcoming product is the Candy Tree. LoveMelancholy all sells Kutsuwa Eraser and air dry Clay Kits! She got ALL the range of the Eraser Kits, and most of the air dry Clay Kits! They have the newest Eraser kits; Squid Bread, Lollipop and Taiyaki! The Taiyaki set is in my shopping list! Also, there are the Deluxe kits and the lesser known bread shop kits and more! Wide range of novelty sweets and toys from Japan! They have good, friendly services and will not bite as long as you adhere to their terms and conditions! I have purchased from them for many times. Very trustworthy and reliable. They are not available to answer to you immediately, so do respect their space! LoveMelancholy ships overseas too! Just drop them an email!